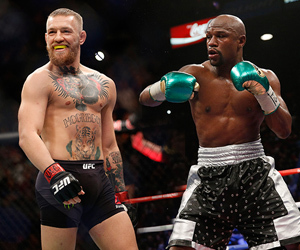 Let’s get something straight right out of the gate: the odds for the newly announced and already massively-hyped Floyd Mayweather vs. Conor McGregor fight are skewed. For all those hearty McGregor fans already betting their money hand over fist, it’s not a case in which the outspoken Irishman should be less of an underdog. If anything, he should be a far greater dog for this August 26 spectacle at T-Mobile Arena on the Las Vegas Strip. “To show how mispriced the fight is in terms of actual probabilities. Floyd was -3,500 vs. a boxing CHAMPION in Andre Berto but only -1,000 here,” Holt tweeted out, in a comparison to Mayweather’s last fight, in which he scored an easy unanimous decision in September 2015. Oh, and Holt’s tweet was sent Thursday morning. Since then, there’s been another day’s worth of bets flooding in on McGregor – batches and batches of $10, $20 and $50 wagers – that dropped Mayweather down to -650, with McGregor just a +475 underdog on the buyback. “The reason for this pricing currently, and more importantly the early on action on McGregor, is simple: sharps do not want to tie up their money for more than two months if they believe they can still get a good price later,” said Holt, whose operation supplies odds to CG Technology sportsbooks around Vegas, including at The Cosmopolitan, M Resort and the Venetian. Thus, there probably won’t be a massive wave of Floyd money until we get much closer to the actual fight. The line dropped all the way to -650 Thursday, as all the books took nothing but small bets on McGregor. To more simply explain why the odds are where they are, think of the quote from infamous criminal Willie Sutton, who when asked why he robbed banks replied: “Because that’s where the money is.” Right now, almost all the money – even though it’s primarily a sea of small bets – is on McGregor, so the odds have to adjust to reflect that fact and deflect at least some liability. That could be changing, though, now that the mega-matchup is set. If you’re confident that Mayweather will win this match with ease – which is what many oddsmakers and experts believe will be the case, whether by knockout or lopsided decision – and you’ve got the money to make the return on investment worthwhile, then why wouldn’t you bet on Mayweather? If this was your 401(k) plan or an IRA, you’d be thrilled at a 10 percent return on investment. So why wouldn’t it be the same for deep-pocketed bettors – particularly professional players – with the supposed sure thing in Money Mayweather? That’s how it should be looked at now, at least according to highly-regarded MMA and boxing oddsmaker Joey Oddessa. And again, the return on Mayweather has already increased at some spots such as CG, at about 17 percent now. Still, as with many other sports, popularity draws betting action. Holt rightly notes that McGregor is by far the most popular male fighter in the history of MMA, while on the flip side, many people are not fans of Mayweather, for a variety of reasons. That doesn’t mean all the money will continue crashing in on Conor. There will be an ebb-and-flow over the next two and a half months. Holt said there are essentially no limits on bet size for this fight, though he added that if someone got crazy and wanted to put down $5 million, CG might not be able to take all of that. But the big wagers will definitely be there, and they’ll be on the relatively underpriced favorite Mayweather. “Let me put it this way: we already anticipate taking seven-figure wagers on Floyd by fight night,” Holt said. Many books expect to need Mayweather in this fight, with an opportunity to clean up on the deluge of McGregor money. Oddessa certainly isn’t going to argue against that notion. “Don’t let anyone kid you. This is like the invisible man, Floyd Mayweather, robbing Fort Knox without getting a scratch on him,” he said, alluding to Mayweather’s possible $100 million payday. “He walks in the ring, moves around out of reach of McGregor’s desperate shots. Floyd maybe bruises a knuckle or two, and walks out almost twice as wealthy. The same can be said of Conor regarding the payday, but he’s going to take some shots. Even if the odds fall far short of suggesting that.